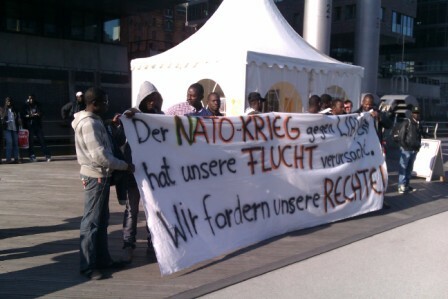 https://vimeo.com/65158161 and to Ousmane: https://vimeo.com/65158162) made by refugees from the protest camp in Kreuzberg/Berlin, refugees in Hamburg who come from the same background adopted the declaration On the first of May they started a first public appearence during the nationwide church day in Hamburg. At 6 p.m. a group of more than 50 refugees gathered with banners and leaflets in the habour at a place where a part of the church day program takes place. They informed the public about their situation and called for solidarity. On Friday 3rd of May from 10 am the whole day the refugee group together with the "caravan for the rights of refugees and migrants" and the leftists from "atesh" will exercise a programm with information material and film screening and people to people talks during the whole day. The place where you can meet us that day is Sandtorkai (Hafencity) in Front of the MS Anton (refugee boat project). 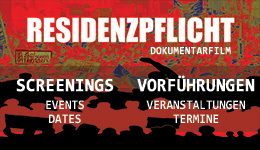 Die Erklärung "Lampedusa in Berlin" (interview to Bashir: https://vimeo.com/65158161 and to Ousmane: https://vimeo.com/65158162), die von Flüchtlingen des Protestcamps in Berlin-Kreuzberg veröffentlicht wurde, übernahmen Flüchtlinge in Hamburg, die aus der gleichen Situation kommen. Sie begannen heute, am ersten Mai, ihren ersten Auftritt in der Öffentlichkeit während des bundesweiten Kirchentages in Hamburg. Um 18 Uhr versammelte sich eine Gruppe von mehr als 50 Flüchtlingen mit Transparenten und Flugblättern im Hamburger Hafen, an dem Platz, wo ein Teil des Kirchtag-Programms stattfindet. Sie informierten die Öffentlichkeit und riefen zur Solidarität auf. Am 3. Mai von 10 Uhr morgens an wird die Gruppe der Flüchtlinge zusammen mit der KARAWANE und der linken Gruppe "atesh" den ganzen Tag über, Informationen verteilen, Filmdokumentationen zeigen und Gespräche führen. Der Platz, wo ihr uns treffen könnt ist: Sandtorkai (Hafencity) direkt vor der MS Anton (Flüchtlingsboot-Projekt). "We're here and we don't go back"
Thousands of us are now in Germany in the same conditions: no housing, no access to social help, no access to the job market. We demand a political solution: "We are here and we don't go back!". We want the right to make a living here in Germany. If we had found possible conditions in Italy we would stay there. There was no possibility to handle anymore. Italian government in the beginning of 2013 closed the programs of reception - the so-called Emergency North Africa - throwing the people basically on the street. 400-500 euro were given to each refugee with the suggestion to go away. Where? To northern Europe. The problem is now on a european level being Germany one of the most powerful states, decision maker for the migrations and asylum policies in Europe. The Dublin System - with the rule that the Refugees "belong" to the first country in Europe they arrive - is aimed to deny the right of the Refugees to choose where they want to live. The same ideology that's behind the Residenzpflicht. We don't want to live in the streets and forced to street prostitution, drug dealing or other criminal acts. le systeme du Dubin doit etre termine. protesto dos refugiados no kirchentag - declaração e convite!